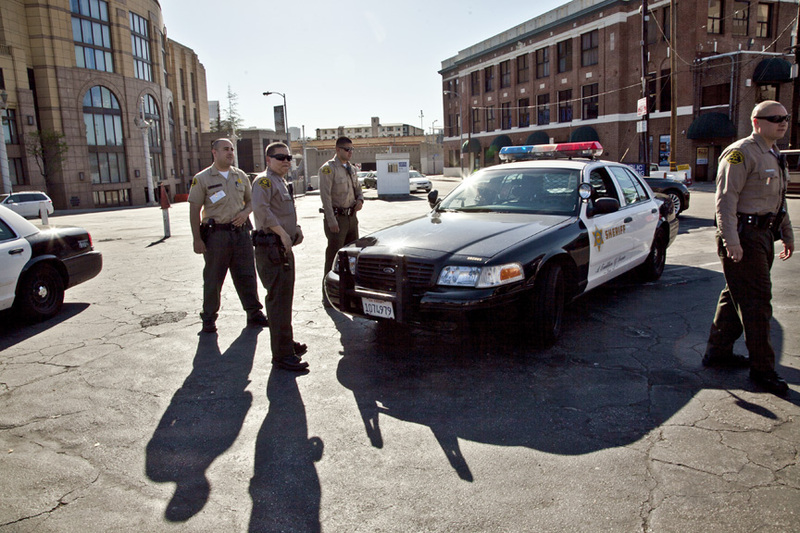 Was briefly detained today by L.A. County Sheriffs, while on assignment for the L.A. Weekly. I was shooting the Men's L.A.County jailhouse building from the sidewalk and was stopped by sheriff deputies. I was searched for weapons and was run through their computer system. They told me that the jail is private property, and there are national security concerns about photographing the facility. I told them I was a news media photographer working on a up coming story for the L.A. Weekly newspaper. Was able to turn on the video function of my Canon 5D Mark II about 3 minutes in to the stop. One deputy removed the camera from around my neck, and placed it on the back of his squad car. After a total of six deputies check me out, my camera was returned to me and I was released to continue my assignment. Actually snapped one image of them as I walked away. Although the deputies were polite and professional, it seemed highly unnecessary for a total of 6 deputies to harras a working media photographer for shooting exteriors of a public building from a sidewalk.